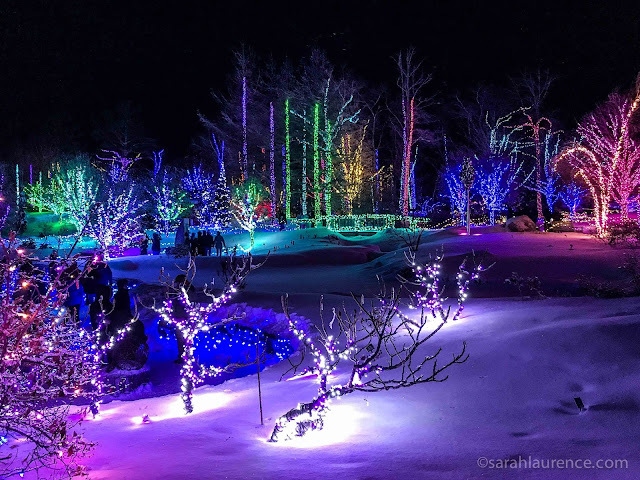 Coastal Maine Botanical Gardens Aglow brightens the long nights from mid November to New Year's Eve. 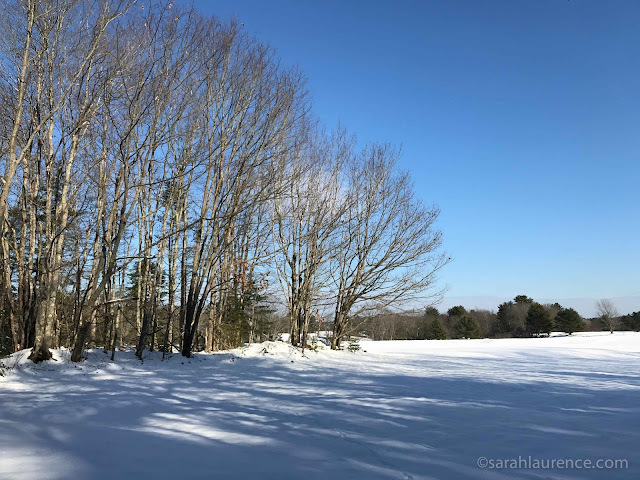 Last night it was 15F at 7:00 pm on the warmest day of the week. I was amazed to see more people than on a spring day, but crowds dispersed over the extensive grounds. Be sure to reserve tickets online in advance. 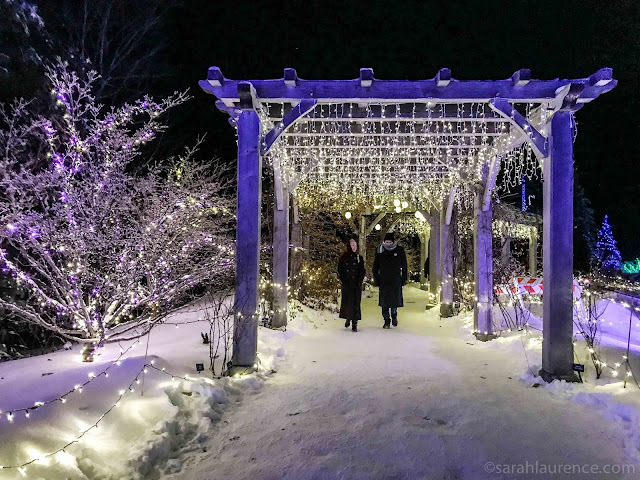 Mainers dress winter chic in long coats and high boots. In summer, roses adorn this veranda. 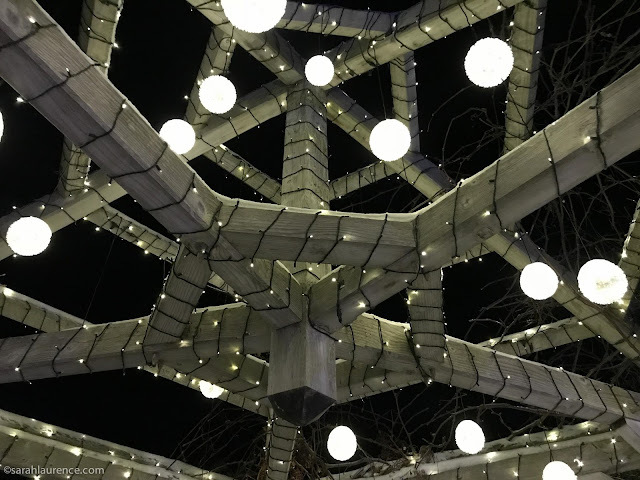 We wondered how long it took to hang over half a million LED lights. 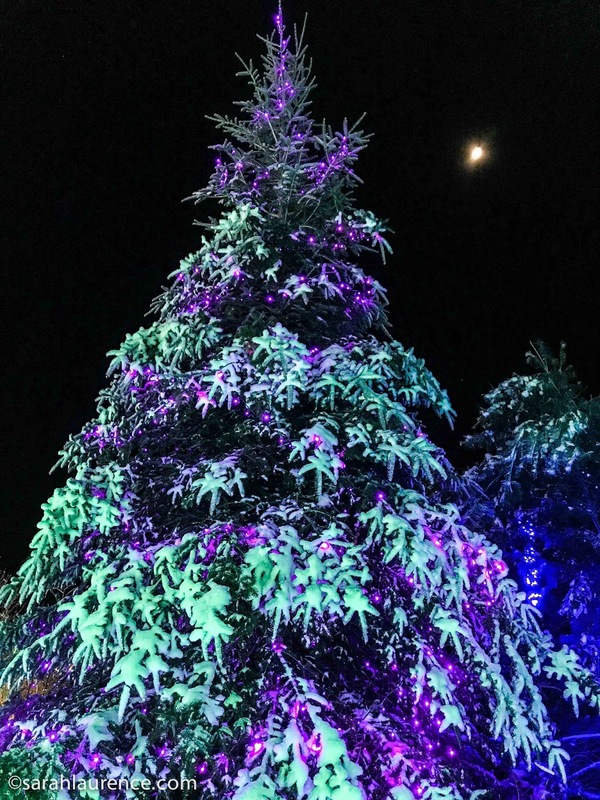 Evergreens twinkled like Christmas trees under a half moon, but there were no holiday decorations. 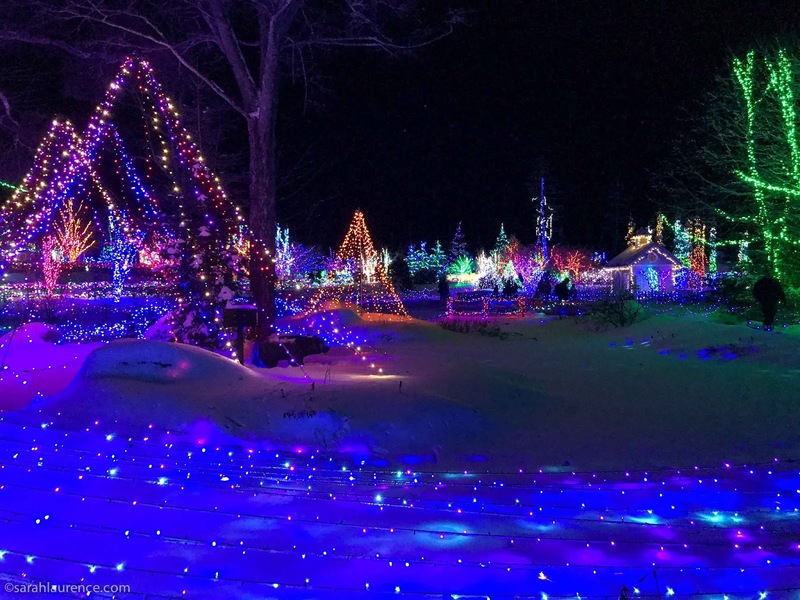 Gardens Aglow is a nondenominational festival of lights; it felt spiritual but was not religious. Storm buried lights made the snow glow like a phosphorescent sea. 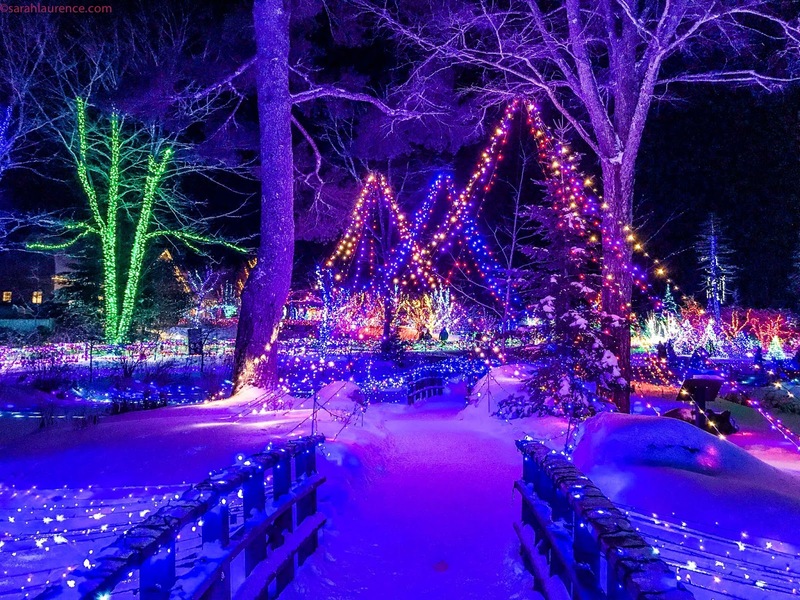 An hour was barely enough time to see all the lights with a warm up break inside. There was hot cocoa, kettle corn, chili, and cocktails too. Next year we'll allow more time. Afterwards my family drove ten minutes to McSeagull's for dinner on Boothbay Harbor. A hot Sailor's Cider warmed me up and the fish and chips were excellent. There was also gluten free pizza for my daughter, who declared, "Gardens Aglow was lit!" We agreed that it was a brilliant way to end the year. If you're looking for good holiday gifts for teens, here are my suggestions from the 61 books I read this year. 2017 was a fabulous year for diverse contemporary young adult fiction. Follow the links to full reviews posted earlier on my blog or Goodreads. Since we're already halfway through Hanukkah, I'm starting with two novels with Jewish protagonists. 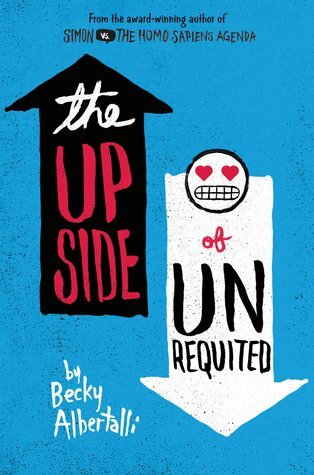 The Upside of Unrequited by Becky Albertalli is a sweet romance with secular Jewish characters. Molly has had 26 crushes on boys but hasn't even been kissed. She fears that no boy would be attracted to a big girl. Meanwhile her skinny twin sister has hooked up with several girls but has never had a serious relationship. As the twins discover romance, their sisterly bond is tested. Set in Washington DC during the summer when gay marriage became legal, the twins are also busy planning a wedding for their moms. This comedy of errors also has a full cast of racially diverse characters who break stereotypes. I loved the author's debut, Simon vs the Homosapien Agenda, which is a gay YA romance. 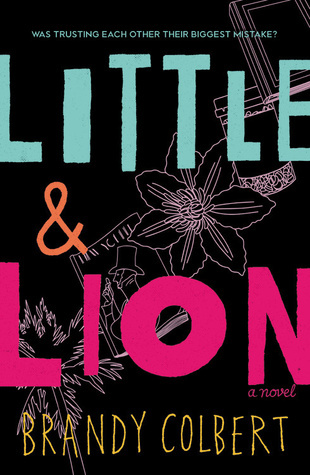 Little & Lion by Brandy Colbert also features a nontraditional Jewish family. Little/Suzette and her African American mom converted when they moved in with Saul and his son Lion/Lionel. While Lionel grapples with his bipolar disorder, Suzette is trying to figure out her sexual identity. This intersectional novel set in the diverse and affluent suburbs of LA tackles everyday prejudice toward people of color, bisexuals, and mental illness. Despite the gravity of the issues, steamy romances makes it a fast and easy read. 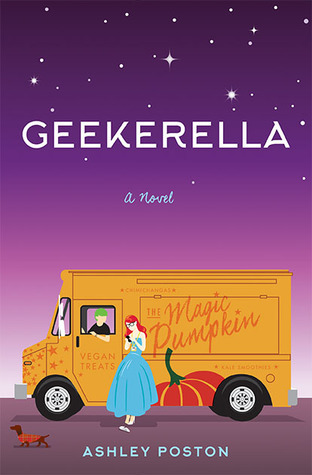 Another YA romance I enjoyed this year was Geekerella by Ashley Poston. This humorous retelling of Cinderella is set at a comic convention with a cosplay ball. The two narrators are a fangirl blogger and a hot teen actor, who stars in a controversial remake of a Sci Fi classic. They met online and communicate via text so are unaware of the other's true identity. A lesbian teenage seamstress plays fairy godmother, and her orange food truck sells vegan pumpkin treats. This quirky debut novel celebrates geekdom and friendship as much as romance. The Hate U Give by Angie Thomas was my favorite book this year. This Black Lives Matter story narrated by a African American girl who witnesses the police shooting her friend has been on The New York Times bestseller list since it was released in February. While I was abroad on sabbatical, I listened to the fantastic audiobook and bought the hardcover when I returned home to reread. This debut is brutally honest and devastating but also uplifting and empowering. 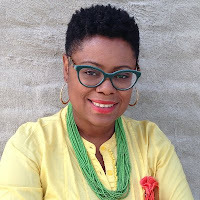 American Street by Ibi Zoboi is another topical novel about black Americans. 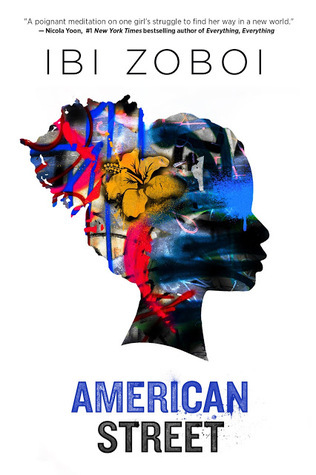 This stunning debut focuses on Haitian American immigrants in Detroit. In the first chapter the protagonist's mom is detained by ICE. A federal agent offers to help Fabiola in exchange for information about her Detroit cousin's drug dealer boyfriend. Add a romance with the boyfriend's best friend and a touch of magical realism and the story becomes enchanting with lots of good plot twists. 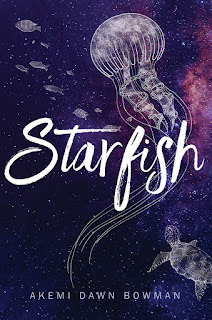 Starfish by Akemi Dawn Bowman is another impressive debut focusing on multicultural identity. Sexually abused as a child, Kiko paints the feelings that she is too anxious to share with anyone. Since her Japanese American father signed full custody to her Caucasian mother, Kiko lost her chance to understand her ethnic heritage. Her narcissistic mom transfers her resentment about divorce into criticism of anything Asian, making Kiko and her brothers ashamed of their biracial roots. Kiko gets a second chance at happiness when her childhood crush invites her to California to check out art colleges. I loved the use of art in the narrative, and the cover is gorgeous too. 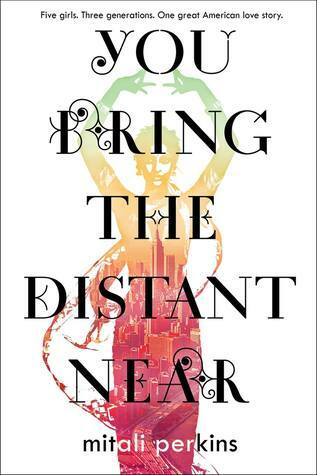 Although 1973-2006 is historical fiction for today's teenagers, I'd also recommend You Bring the Distance Near by Mitali Perkins. This multigenerational family saga about Indian immigrants in the USA focuses on assimilation and racial prejudice in a changing world. It's a heartwarming tale featuring traditional and non-traditional romances with complex family dynamics. Since the central characters are teenaged girls, mothers and their perplexed matriarch, it would cross-over well to adult readers, who would call it contemporary fiction. This multilayered novel would be an excellent choice for a mother-daughter book group or to share with an immigrant grandparent. Nobody captures a teenage boy voice better than Jeff Zentner. In Goodbye Days a boy blames himself for sending the text that distracted the driver and killed his four best friends. His ambiguous relationship with his deceased friend's girlfriend adds romance and guilt. Humor offsets the sadness. There are lots of diverse secondary characters. Although there is a cautionary message, the book offers redemption without being preachy. It was excellent on audiobook as was his debut, The Serpent King. 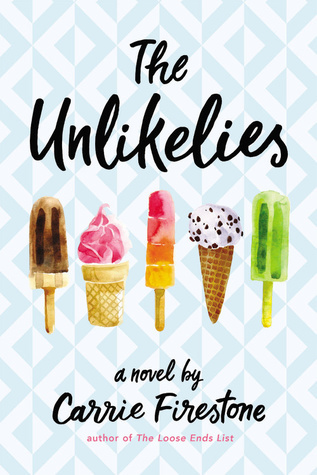 If you're looking for a feel-good story, The Unlikelies by Carrie Firestone follows a secret group of diverse teenagers who engage in vigilante acts of kindness during a summer on the Hamptons. The protagonist is biracial Iranian American. This anti-bullying book will inspire teens to do better online and in the real world. Firestone's fabulous debut The Loose Ends List is out in paperback and features a half Jewish protagonist on a world cruise with her dying grandmother and their eccentric family. 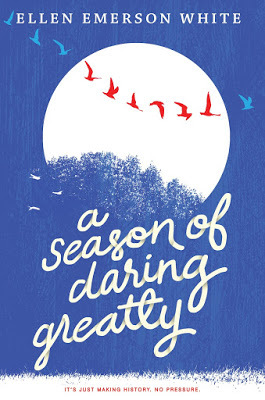 Feminists and sports fans would enjoy A Season of Daring Greatly by Ellen Emerson White, a realistic novel about the first woman (age eighteen) to be recruited for major league baseball. I reviewed it in my last blog post. I'm currently reading Far From the Tree by Robin Benway, this year's winner of the National Book Award. Three siblings reunite after adoption and foster care separated them as babies. If you have other books to recommend for teens, please add them to the comments. I focused on contemporary YA since that is what I write. This young adult novel about the first woman to be drafted for major league baseball is so realistic, it read like nonfiction. The coach/sports photographer author, Ellen Emerson White, writes from experience, but you don't need to be a baseball fan to enjoy A Season of Daring Greatly. Most of the drama was in the locker room/clubhouse. This feminist story focuses on the challenges and historical impact of being the first woman on a professional team. Eighteen-year-old Jill Cafferty is a likable protagonist and a fine role model for girls. She is a skilled pitcher and a strong student but struggles with insecurity in this new and often hostile environment with too much media attention. Her Gold Star family aren't into sports, but they try to be supportive. Her father was a baseball fan who died while serving in the National Guard. It was nice to see a military family in a YA novel, and the author does a fine job of capturing how that background would shape character. I also appreciated how the author included several diverse characters who broke stereotypes. Most of the Hispanic teammates struggle with English, but one is fluent and wealthy. The smartest member of her team is an African American on his way to medical school. Jill is white but speaks Spanish and tries to learn Japanese to make her teammates feel welcome. Although sexual attraction creates issues, the central relationships are friends and family. Her high school friends (one is gay and the other is disabled) keep in touch via text. Jill often regrets her choice not to go to college, but she keeps trying her best. Some of the most touching scenes were when Jill acted out like a normal teen and faced worse consequences. I enjoyed the book from the engaging opening to the satisfying ending, but fewer details about food and minor characters would have sped the pace (432 pages is long for YA). I wondered why Jill didn't defer her acceptance to Stanford for a year so that she'd have a backup if pro ball wasn't a good fit for her. Then again, an all-or-nothing set up makes for higher stakes! 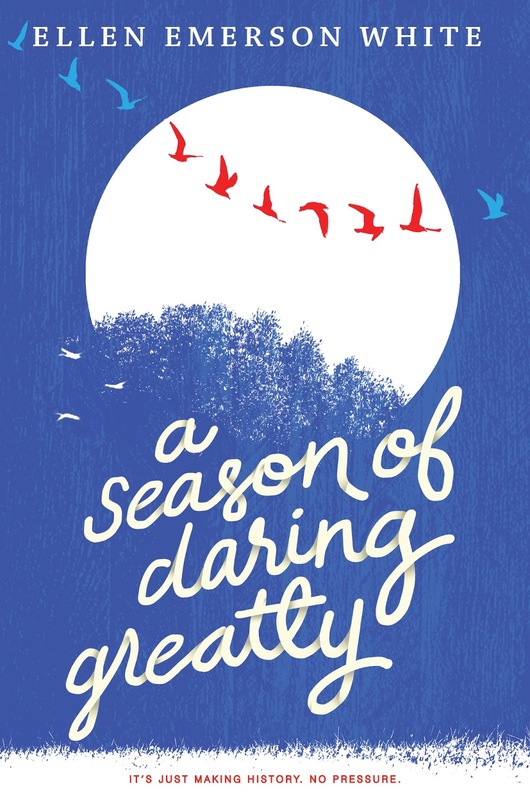 A Season of Daring Greatly would make a fine holiday gift for a sports fan of any age. I loved the cover art too. The gorgeous cover fits this young adult novel about a teen artist. In Starfish, debut author Akemi Dawn Bowman uses art metaphorically to explore multicultural identity, mental illness, and resilience. A victim of sexual abuse as a young child, Kiko paints the feelings that she is too scared to share with anyone. Since her Japanese American father signed full custody to her Caucasian mother, Kiko lost her chance to understand her Japanese heritage. Her narcissistic mom transfers her resentment about divorce into criticism of anything Asian, making Kiko and her brothers ashamed of their biracial roots. Living in a white suburban neighborhood in Nebraska with racist peers doesn't help. Kiko's confusion about her identity exacerbates her social anxiety disorder: "I can't imagine feeling like I'll ever belong anywhere. I'm either too white, or too Asian, but never enough of either. And I'm weird. People don't react well to weird." When her dream art college in NYC rejects her and her abusive uncle moves back in with her family, Kiko drives off with Jamie, an old friend/crush, to look at other art schools. In California she meets a Japanese American artist who offers to mentor her, but her anxiety makes it hard to trust anyone, including herself. Jamie, like the reader, often becomes frustrated with Kiko, but with love and acceptance, her self-confidence grows and her art improves. Their sweet romance offsets the pain. Most chapters end with a description of Kiko's art, which captures her daily mood: "I paint a girl with white hair, blending into a forest of white trees, with stars exploding in the sky above them like shattering glass. If you don't know where to look for her, you might not see her at all." Despite her dark issues, Kiko has a good sense of humor. On her mom obsessing over the "Best-Looking" in her yearbook: "Sometimes it feels like she belongs in high school more than I do." As you can see from these excerpts, Starfish is brutally honest, surprisingly funny, and often lyrical. The author, like her protagonist, is hafu Japanese American and has social anxiety as well. Her novel will help multicultural teens feel less isolated and encourage empathy from others. The sexual abuse part of the story, although understated and not explicit, would make me not recommend this book to younger teenagers. 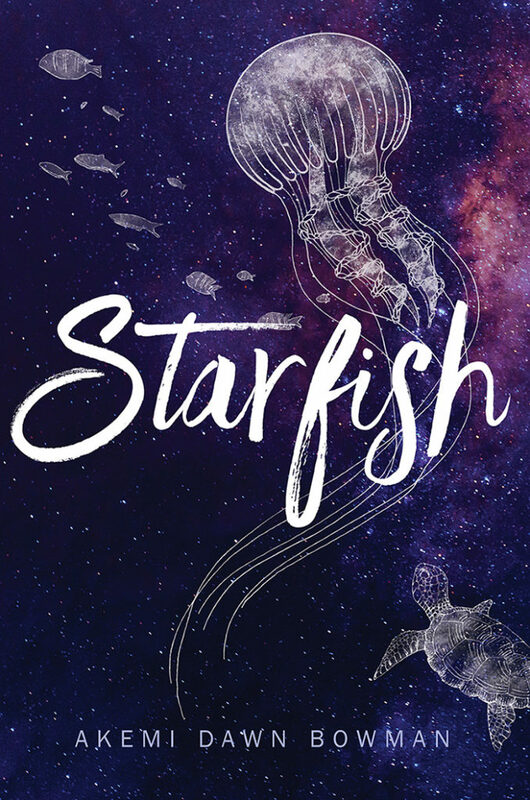 However, Starfish would crossover well to adults since it's so introspective and the central relationship is with the mother. With all the media speculation on a certain president's narcissistic personality disorder, this book is timely. Although the college application process was somewhat unrealistic, the artistic process ringed true. I wish I'd read Starfish senior year in high school, as a young artist myself. Since I was raised with two religions and married an immigrant, I relate to the identity issues facing Kiko. I have faced anti-Semitism but was also told that I wasn't Jewish since my mother was Christian. On the plus side, my brother and I have always been more open to people who are different from us. I married a British man and my brother married a Japanese woman, and we raised our children with multiple religions and time abroad to understand their mixed cultural heritage. Blended families need books like Starfish. Thank you, Akemi! Reviewer's Disclosure: The hardcover was published in September, 2017. I searched four bookstores until I found Starfish at Print: A Bookstore in Portland. I connected with the author on twitter. 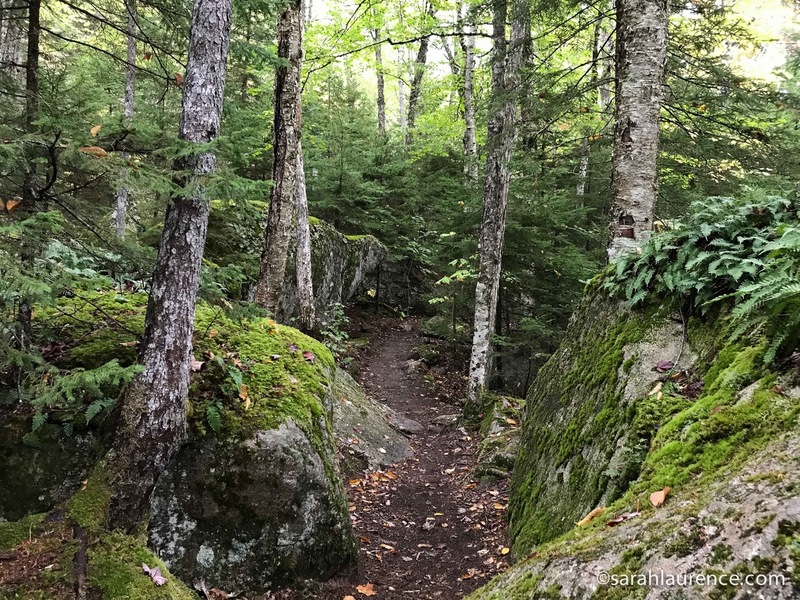 Care to join me for a virtual hike in Maine? On October 10th we set off for the Bubbles, a pair of conjoined mountains in Acadia National Park. The trailhead 14-spot parking lot is frequently full so we had to park at Jordan Pond, a couple of miles down the park road. 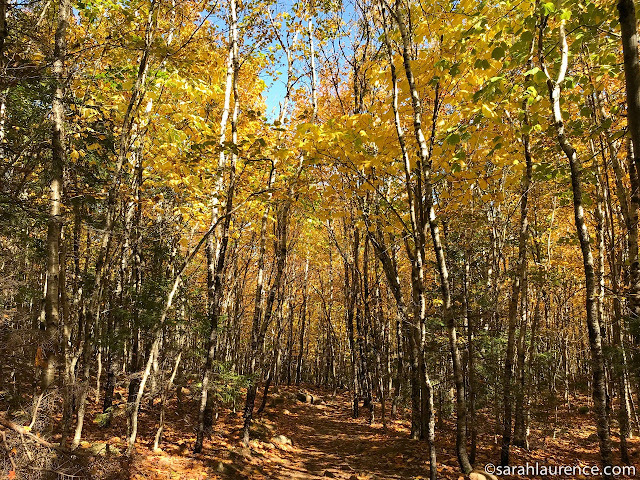 At the far end of the flat Jordan Pond trail, there is a choice between a steep trail up South Bubble or a more gradual trail (good for hiking poles) that winds through golden birch tree groves, which we chose both ways. Round trip, the moderately easy hike was three hours with many photo breaks. We didn't have time to include the North Bubble. 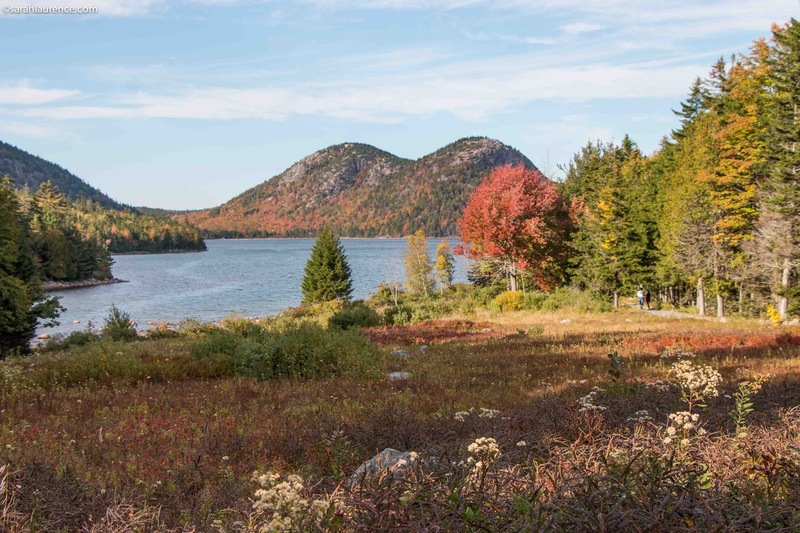 ...and Jordan Pond plus the ocean islands to the south. The open summit would be a good picnic spot. Another lunch option, if you're willing to wait an hour for a table, is Jordan Pond House overlooking the pond and the Bubbles. This in park restaurant is renowned for its oven warm popovers (American Yorkshire Pudding). My local lobster salad and crab cake and my husband's Shepherd's Pie were excellent. Afterwards we admired the wildflower meadows before our three hour drive home. A less well known hike with good ocean views is Beech Mountain (previous post). 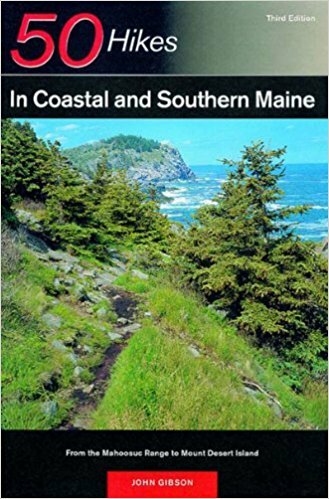 We found both hikes in 50 Hikes in Coastal and Southern Maine by John Gibson, my favorite Maine guidebook, which also explains the geography of the terrain. I'd recommend a waterproof trail map and a compass too. Acadia is most busy late June through Labor Day and for peak foliage in mid October. To save time, buy your park pass online and avoid the park road loop at midday. You can also take the park shuttle bus. 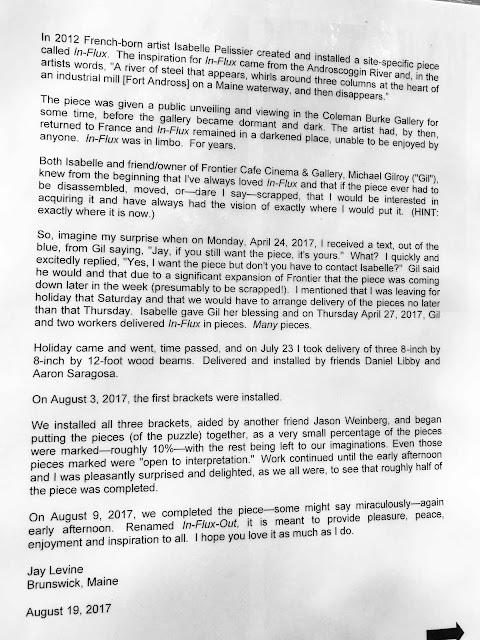 Note that Jordan Pond House and some town businesses close off season. 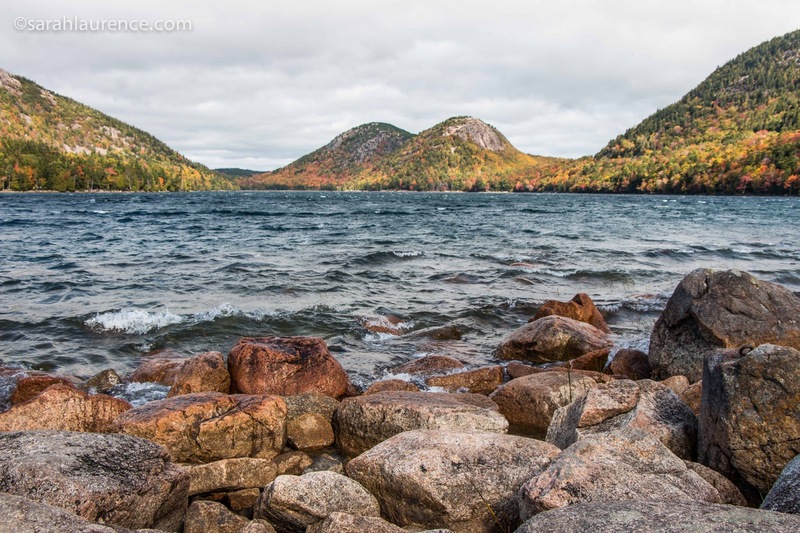 Despite the crowds, Acadia National Park is one of my favorite places in Maine. 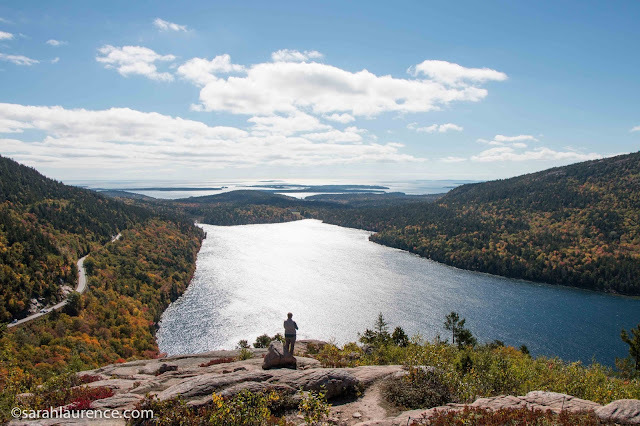 Acadia National Park's seaside mountains attracts visitors from all over the world, but most tourists don't wander far from their cars. Beech Mountain (above photo) on the remote western corner of Mt. Desert Island is an excellent hike to avoid the crowds. At only 700 feet, it's more of hill than a mountain but still quite steep on the slick granite. Hiking boots are a good idea, but this trail is too rocky for hiking poles. 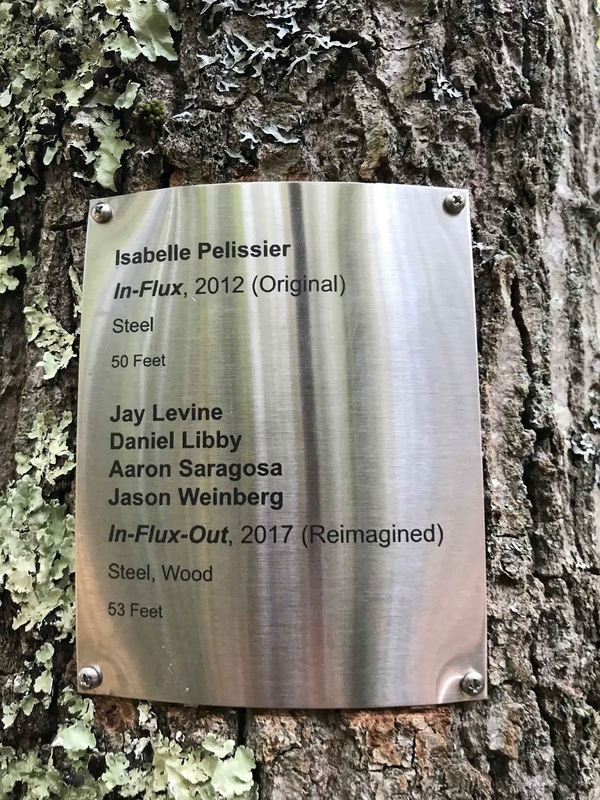 My husband and I woke early on Indigenous People Day (our town renamed Columbus Day) to hike before the afternoon rain. At sunrise, there was a cool fog bow over Bar Harbor. It's about a half hour drive from town to the trailhead (northwest corner of the parking lot). On a clear day, the fire tower at Beech Mountain offers a panoramic view of Mt. 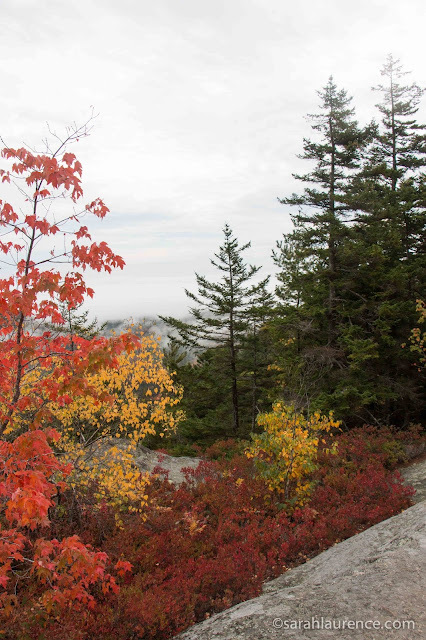 Desert and the Cranberry Islands, but it was also quite lovely in the mist with peak foliage. Dense fog hid the sea. 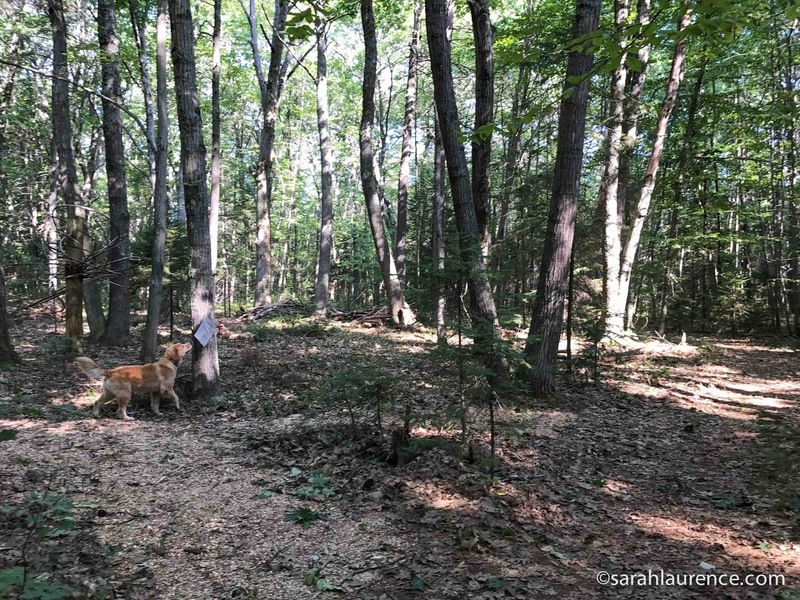 Bright red maple trees and blueberry bushes still managed to flame through the misty evergreens. 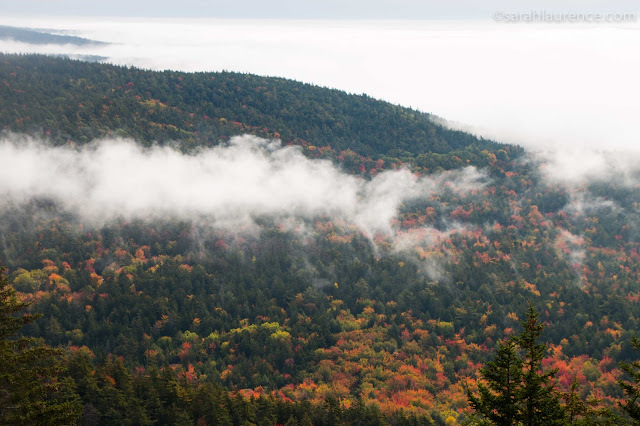 The colors were all the more vibrant against the mist. 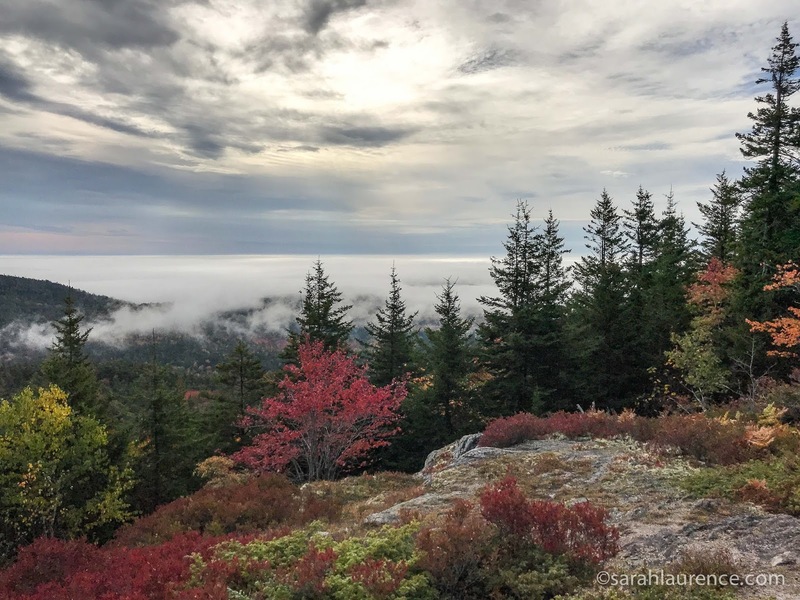 From the open peak, the South Ridge Trail follows the granite ridge over lichen and descends gradually in switchbacks through a pine forest. The tall pines with dripping ferns, lichen and moss reminded me of the Pacific Northwest or Japan. 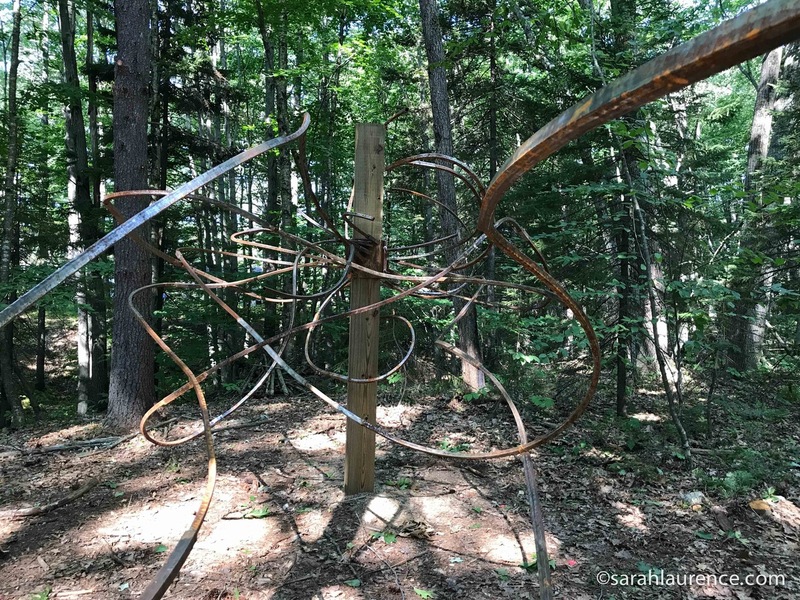 There is such an interesting variety of terrain in Acadia, compared to other parts of Maine. Stopping frequently to take photos, the 3 mile loop took us about 2 1/2 hours. It was too wet to complete the Canada Cliff and Eagle Cliff loops near the base. 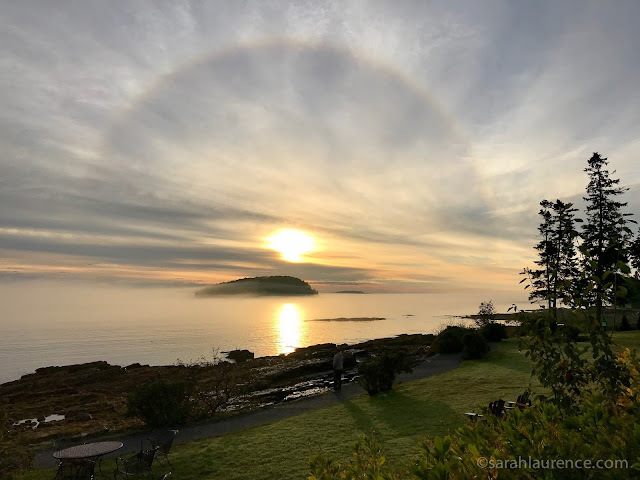 Since Acadia is nearly a three hour drive from home, we spent two nights at the Bar Harbor Inn, which has excellent views of the harbor and is close to the restaurants and shops in town. 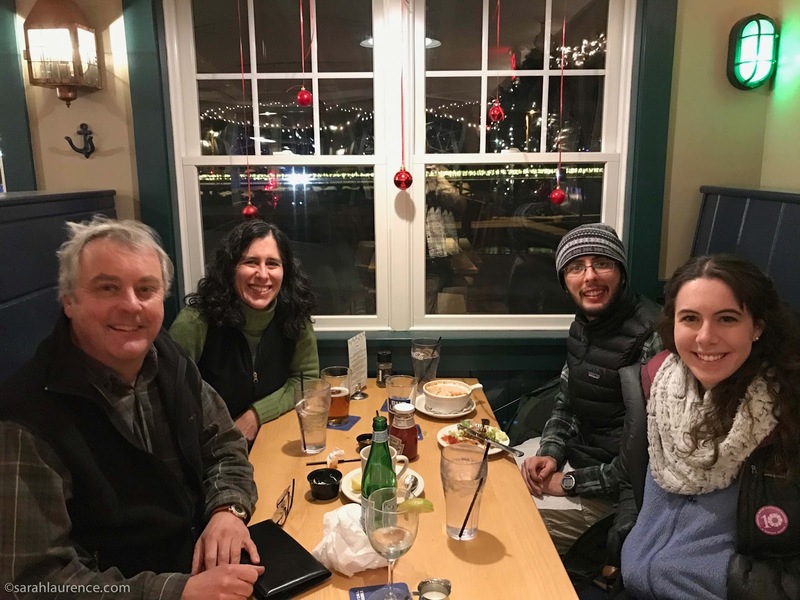 We met our son and his girlfriend, who hiked a more challenging trail in the rain, at Havana for a delicious dinner. I'd also recommend the Side Street Cafe for lunch or dinner in Bar Harbor, and you'll also want to browse in Sherman's Bookstore nearby. Luckily for us, the skies cleared on our last day. 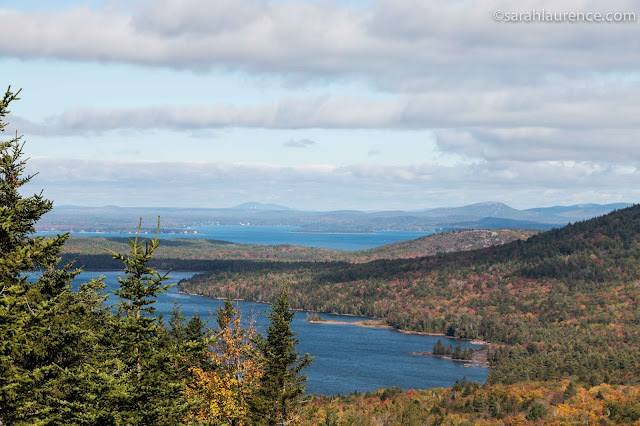 I'll share sunnier photos in my next Acadia post, later this month. 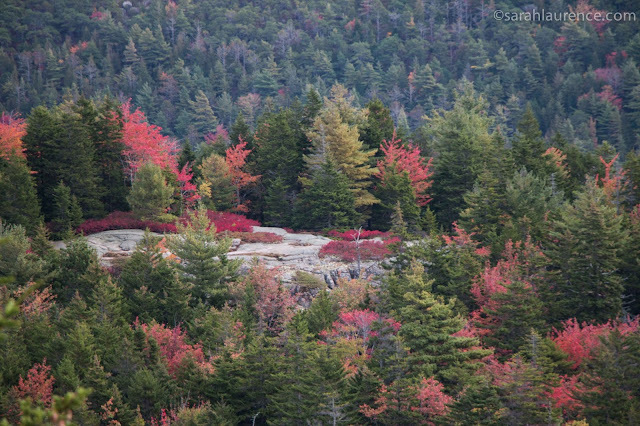 The foliage is also gorgeous back at home. This photo is from my regular bike ride, a seven mile loop from my house past farmlands and a tidal estuary. 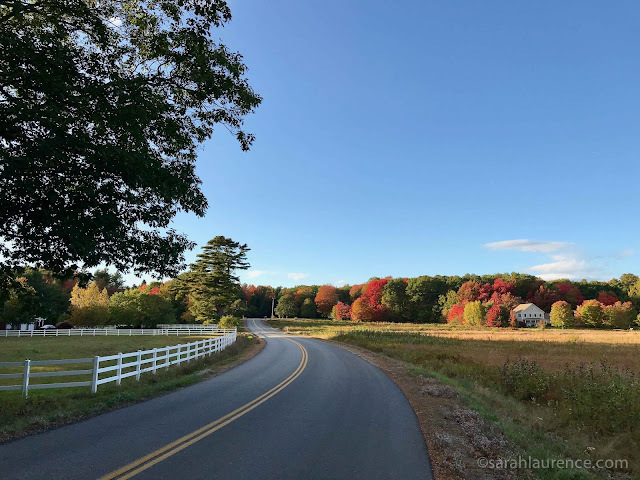 I love Maine in October! If you're looking for an excellent ghost story for October, check out S.M. Parker's The Rattled Bones. This chilling tale of the past haunting the present is all the more horrific for being based on a true historical event. 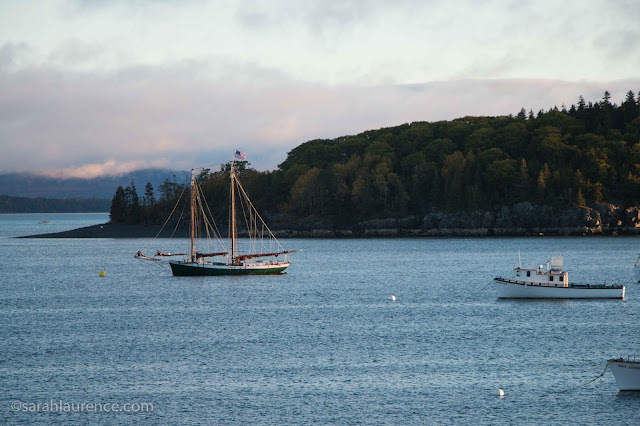 In 1912 the governor of Maine ordered the evacuation of Malaga Island. 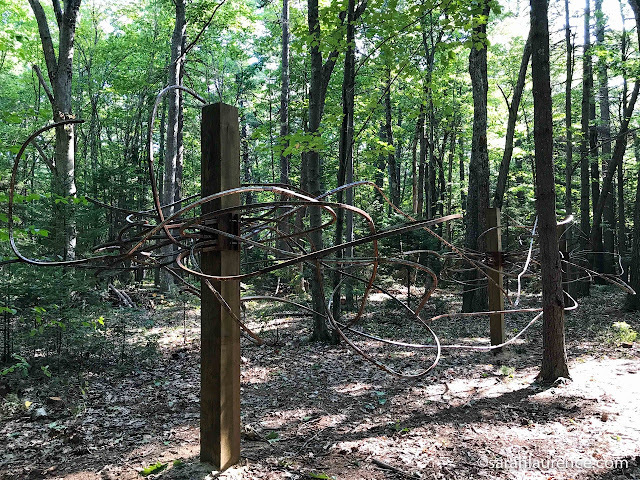 The residents were black, white, and mixed race, and several were incarcerated at the Maine School for the Feeble Minded, which became Pineland Farms. For her novel, Shannon M. Parker pushed this true incident forward a couple of decades and added a present day family living on the mainland, overlooking the now deserted island. Sam, an Archaeology intern at USM relays the history to Rilla, the eighteen-year-old protagonist who befriends him while fishing off the island. The Rattled Bones opens with a double tragedy. Rilla's mother is sent to a mental hospital, leaving her to be raised by her grandmother. Twelve years later, Rilla takes the helm of her father's lobster boat after he dies at sea. Rilla is torn by her desire to be the first in her family to go to college and her obligation to support her grandmother. When an island ghost starts haunting her, Brilla fears she has inherited her mother's insanity, but she wants to help the ghost and solve the mystery. This young adult novel was hard to put down. Bustle called The Rattled Bones a "feminist ghost story" for many good reasons. The lobster fishing scenes were even more compelling than the ghost story, capturing the challenges a female captain faces in a male dominated industry. Rilla and her sternman Sam were smart, likable characters who treat each other with respect. My favorite character was the self-sufficient grandmother who listens to The Who while painting in the attic. Even the ghost was a well developed diverse character, a dangerous mix of good and evil. The ghost died before her time, but nevertheless, she persisted! I had only a few criticisms of this well-crafted book. I would have preferred a transitional scene between the first and second chapter to show Rilla's relationships with her father and her high school boyfriend before tragedy struck. I also craved a final scene with the missing mother. The dig scenes, especially at the end, didn't always ring true to slow-paced Archaeology but made for a dramatic story. Overall though, the historical material was educational and well presented in engaging dialogue. Lyrical passages captured the gorgeous setting and enhanced suspense. 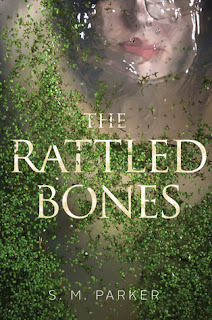 The Rattled Bones was a fast, fun read which will appeal to both teens and adults. 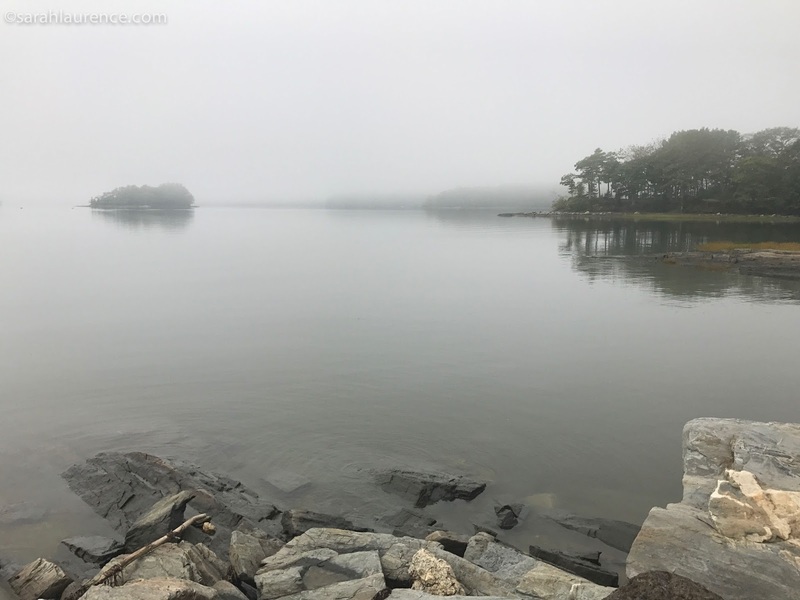 "The morning fog parts as I push against its thickness, the displaced mist twisting into thin gray fingers, beckoning me toward deeper waters." "His apology surprises me. A boy who apologizes for interrupting a girl might be as rare as photos of the island." 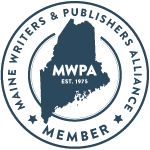 Last night Shannon M. Parker was on a YA panel with Maine authors Gillian French and Maria Padian at Print Bookstore in Portland. I've read and enjoyed all of Maria's books and Gillian's debut, Grit. Islandport Press editor Melissa Kim moderated the lively discussion and also published Gillian's The Door to January, which I purchased after hearing Gillian read a spooky excerpt. This was my second time meeting Shannon, who was my partner years ago in a YA workshop. I'm looking forward to reading her debut, The Girl Who Fell. It's so exciting to see her books in print. Well done, Shannon! I was walking in the woods when my usually quiet dog started barking: Men with chainsaws were chopping down trees! 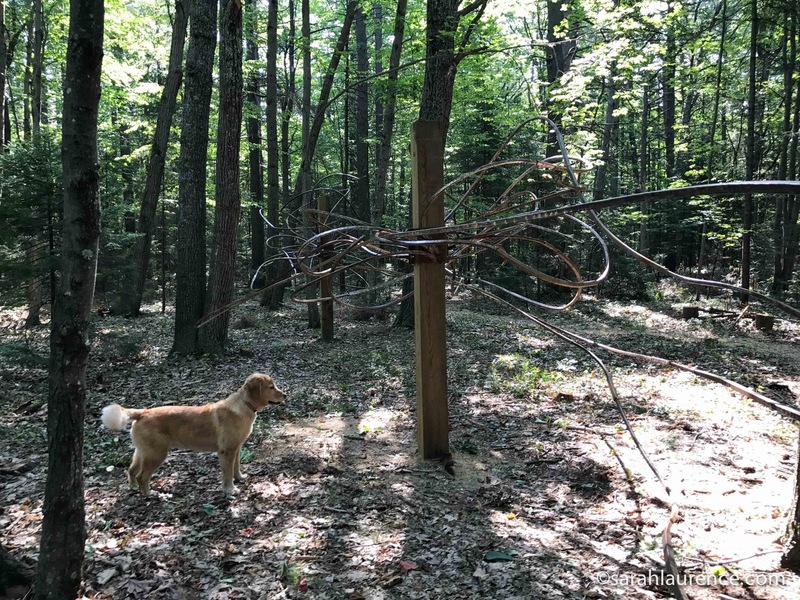 I shared Scout's dismay, but this was not our property so we continued on our way. 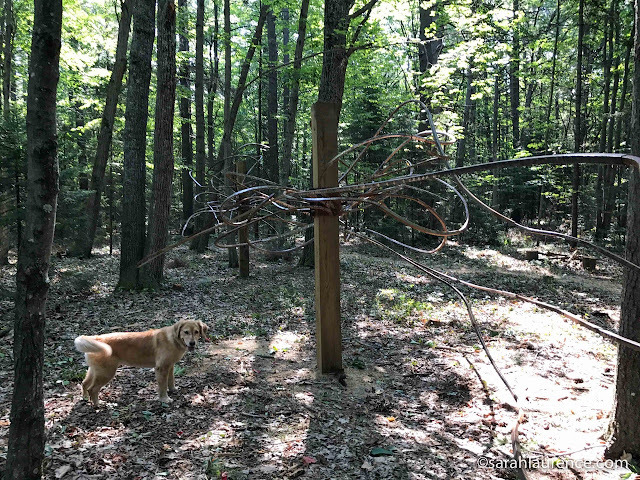 A few days later we returned, and to my delight, instead of a clear cut, we found a sculpture garden. Scout was transfixed, wagging her tail like she'd spotted a wild animal. Then she turned to me grinning, inviting me to come closer. 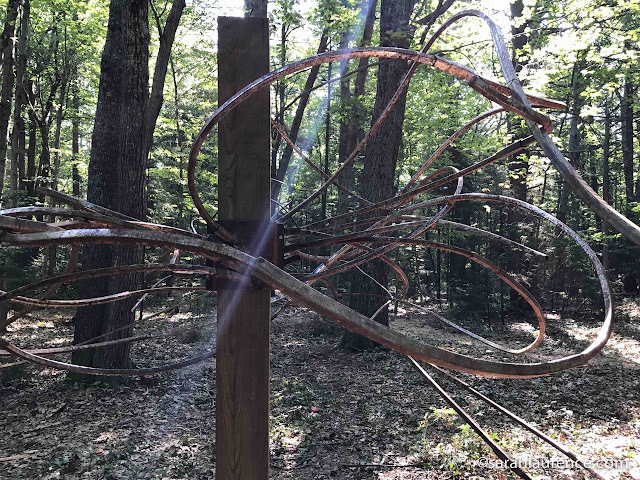 I walked around the installation, watching how the iron caught the sunlight through the trees. The tentacles seemed to move like an octopus underwater. I wondered who had created this gorgeous work of art and why it was installed in these woods. off Pickard Fields at Bowdoin College in Brunswick, Maine. May this new year be better than the last. With DACA repealed and Congress considering new policy, we need books that increase empathy for undocumented immigrants. Back in March I listened to American Street while on sabbatical, and Ibi Zoboi's young adult novel still haunts me like a dream. The first chapter opens with an emotional bang: American-born Fabiola immigrates from Port-au-Prince to reunite with family only to have her Haitian mother detained by ICE agents. Naive and sweet Fabiola struggles to fit in with her street savvy cousins at public school in Detroit. 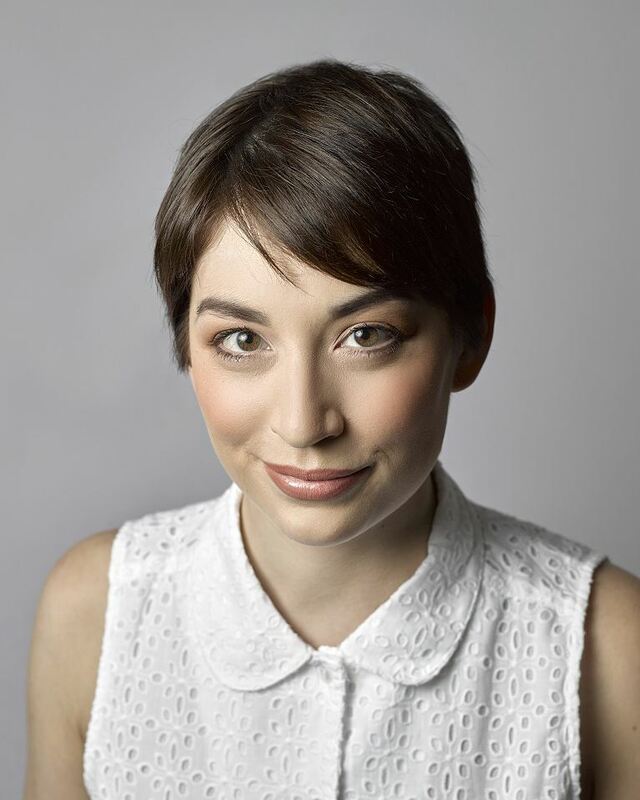 Living abroad in Japan and the UK, I could relate to her challenges of assimilation. This coming of age story with quirky characters felt Dickensian with diverse updates. For example, one of the cousins binds her breasts and is a tough fighter, but her gender dysphoria is part of her character and not a point of narrative tension or an "issue" that needs fixing. Her family, friends, and even her enemies accept and respect her. Other characters reveal secrets that reframe the plot. No one is who they seem to be at first. The line between good and evil often blurs. Although the characters were complex and original, the setting fell into the drugs and violence ghetto stereotype. After several slow chapters about the pains of assimilation and homesickness, the pace accelerates into a suspense thriller. A detective offers to help free Fabiola's mom in exchange for information about her cousin's boyfriend. A troubled Fabiola turns to her vodou faith for guidance. The story becomes surreal when late at night, a homeless man starts singing cryptic messages to her. It's rare for a book to surprise me, but American Street was delightfully full of unexpected twists. The moral ambiguity forces readers to draw their own conclusions. The audio book narration, once I got used to the Haitian accent, was excellent. As the story became a page-turner, I kept walking and walking. I got very fit, but it would have been easier to follow the plot twists on paper. I had to listen to the last chapter twice, and still it felt unresolved. I'm hoping for a sequel to this impressive debut (published February 2017). I'd recommend American Street to both mature teens and adults. It would be a good audiobook to listen to while driving your high school students to school. Teachers and librarians should add this novel to their immigrant literature section. Reviewer disclosure: This ebook is from an audible.com subscription. I prefer books in print, but digital books were the only way to read American new releases while on sabbatical. Sunrise photo is from my family vacation in Massachusetts. 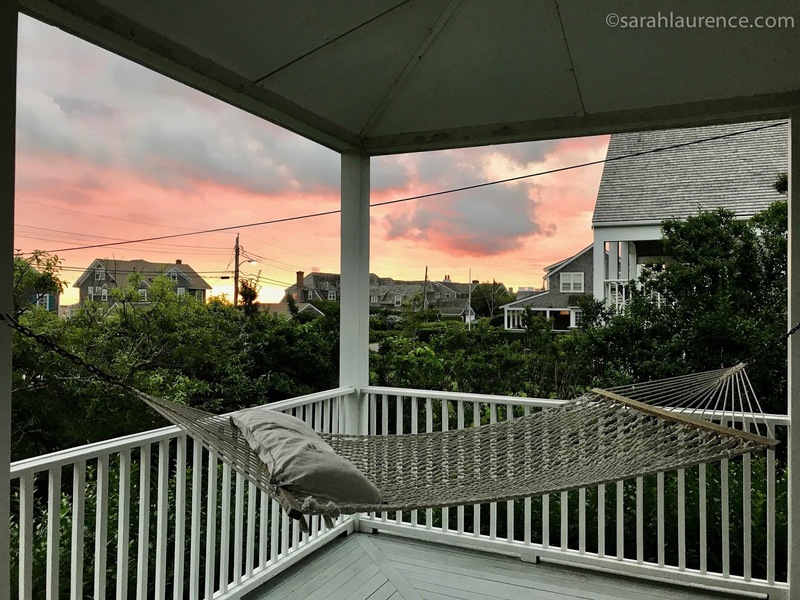 I'm missing those warm summer days of reading in the hammock.